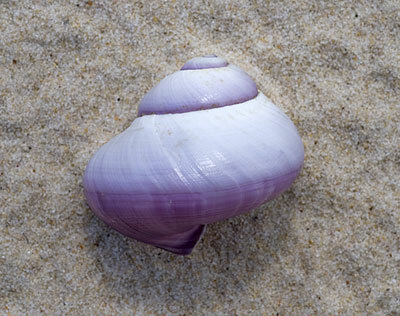 The Violet Snail is a thin-shelled marine snail that lives out its entire life cycle floating on the surface of the ocean, but often seen washed up on beaches after strong winds. They have a very beautiful violet-blue and whitish coloured shell. Violet Snails do not swim but use a bubble raft to keep them afloat, secreting mucus from a gland in their foot which traps air bubbles and then hardens to form a raft, with the animal floating upside-down. The shell of this species grows to about 40 mm. The Violet Snail feeds on other planktonic animals, especially By-the-wind Sailors, but also small jellyfish and crustaceans. It is found worldwide including both tropical and temperate Australia.